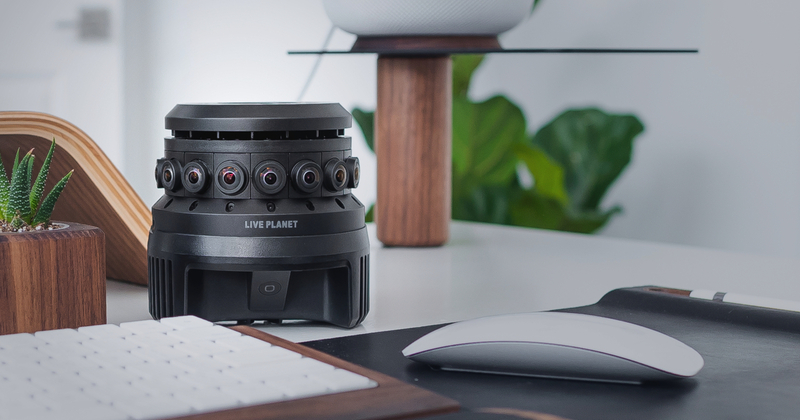 Live Planet has launched a professional 3D 360 camera with live streaming and realtime stitching, offering what may be one of the easiest workflows for professional 3D 360 cameras. Here is a hands-on report. 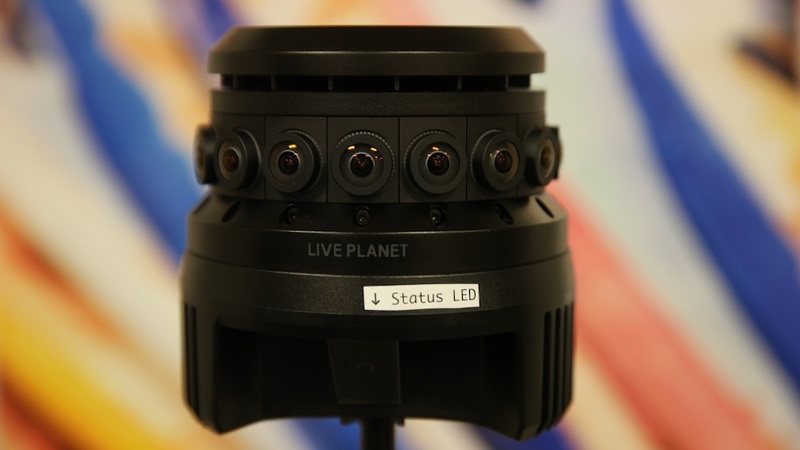 Live Planet is a very compact 4K 3D 360 camera with sixteen lenses. 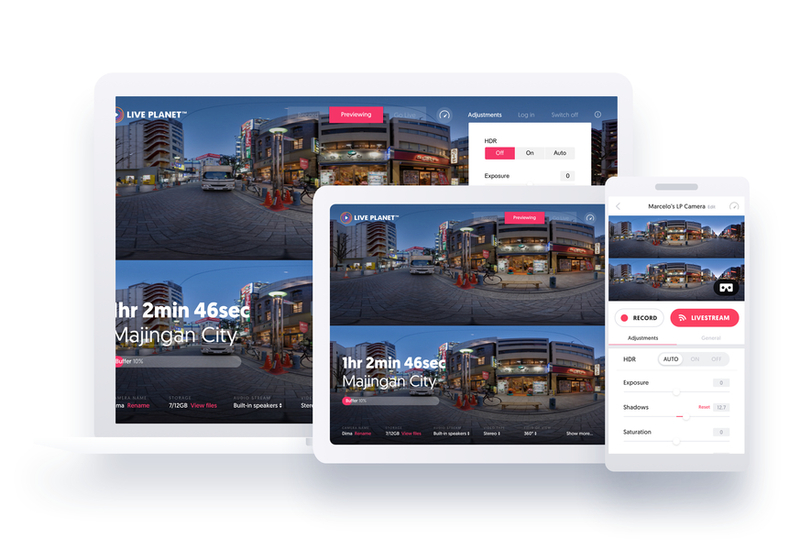 Its key features are realtime stitching and live streaming, and it promises a very easy workflow. Their tagline is, “From box to VR streaming in 15 minutes.” They sent me a loaner camera to try it out. Here are my hands-on impressions. The camera comes in a small Pelican-type case with custom foam cutouts. Besides the Pelican (?) case, the package includes the camera, a padded drawstring pouch, and AC adapter. The Live Planet camera stands out from other professional 3D 360 cameras in a couple of ways. First, it is one of the smallest professional 3D 360 cameras I’m aware of. Usually 3D 360 cameras are large because the lenses are typically separated by the standard interpupillary distance of around 6.3cm. Hence the Insta360 Pro, Insta360 Pro 2, and Kandao Obsidian R and S, and the Kandao Obsidian Go, each with 6 lenses in a radial configuration, are all about the same diameter of approximately 5.6 inches (14.3 cm). The Live Planet on the other hand, has a diameter of only around 3.5 inches, and a height of around 4 inches. It’s about the size of a large restaurant burger. The reason it is smaller is that Live Planet uses a different lens configuration. In the diagram below, the red lenses represent lenses that capture the left eye, while blue lenses represent the right eye. Instead of pairing lenses next to each other (blue braces below), Live Planet pairs every fourth lens (green braces below). 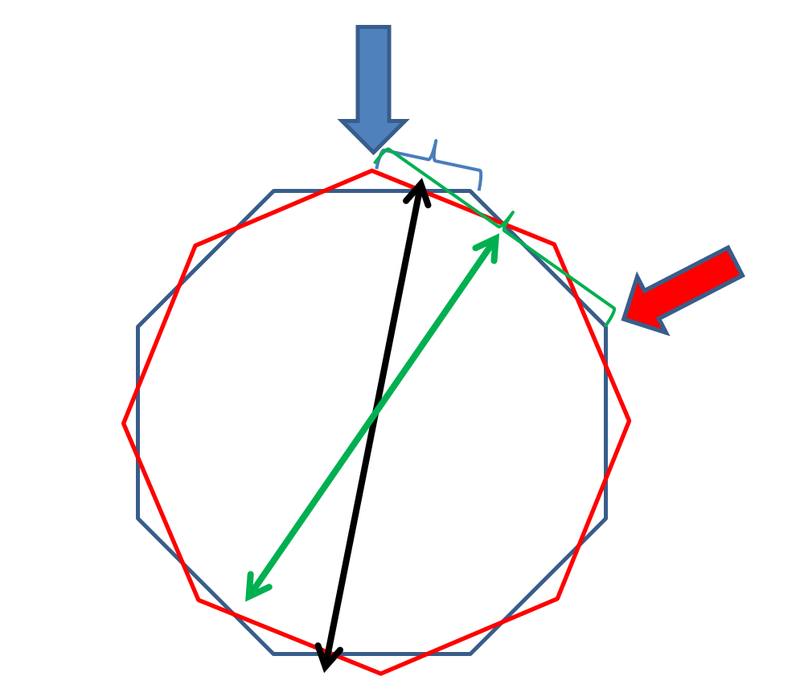 This results in a shorter distance between lenses (green line is shorter than the black line), which reduces parallax stitching error, while maintaining a standard interpupillary distance for adequate parallax for a 3D effect. The Live Planet only has one button – the power button. Below it are ports for AC adapter, Micro USB, HDMI, ethernet jack, SPDIF optical input, and a 1/4-20 tripod hole. Using the Live Planet camera was much easier than I expected. I just plugged the camera to a wall outlet via an AC adapter. This automatically turns on the camera after a few seconds. You’ll hear the internal fan which is noticeable but not so loud as to be obtrusive. It’s probably ok in a church. The camera has no shutter or other buttons. Instead, it is controlled wirelessly via the Live Planet app. I launched the app, and tapped on an icon on the upper left corner. Within seconds, I got a live preview on my phone, in top-bottom equirectangular format. There was a record button and some options such as whether you want monoscopic or stereoscopic. There was also a tab to adjust the image settings such as exposure and saturation. There’s also a tone curve that you can adjust. You can get a 3D 360 live preview. I just tapped on the Google Cardboard icon in the preview screen, which prompted me to insert the phone into a Gear VR headset. The 3D 360 live preview had pretty good resolution. To record the video, I just tapped on the on-screen shutter in the app. The preview remained visible, although the shutter button seems inaccessible from the Gear VR view, so I had to remove the VR headset. The video is stitched in realtime onto a single Micro SD card in an mp4 file in H.264 format with around 50mbps bitrate. In the prerelease version of the camera, it seems the file had no 360 metadata, which I hope they can easily add in the future. The whole process from turning on the camera to recording a video indeed took less than 15 minutes, and not having to stitch the videos was very convenient. However, the camera does have a few drawbacks. First, there’s no built-in battery (although there is an external battery pack available), and there’s no in-camera microphone. Instead, it is designed to be used with professional audio equipment. You can connect a Zoom H2N to the camera via Micro USB to USB, and record sound in stereo. Live Planet has a resolution of 4096 x 2160 at 30fps. However, in the future, the resolution will be improved to 4096 x 4096. This resolution is similar to the resolution of other professional 360 cameras for realtime stitching or streaming. I took test shots last night in an indoor environment (with indoor fluorescent lighting). The detail was pretty good for a 4K camera. The quality appeared decent although not stellar. The auto white balance was not accurate, and much too warm. (Note: I will upload a new sample later with corrected 360 metadata). The stitching is pretty smooth for a camera with sixteen lenses. However, at closer distances, there are visible stitch lines. Note also that the nadir has a small blind spot, although if you will place your own watermark, this is not an issue. You can see samples on Live Planet’s official page. I recommend viewing the samples using the Live Planet app for Oculus Go, Gear VR, or Google Daydream. How does the Live Planet compare to other 360 cameras with realtime stitching capabilities such as Insta360 Pro, Insta360 Pro 2, and Pilot Era? Over the next few days, I’ll be sharing some comparison videos and will be posting them here. 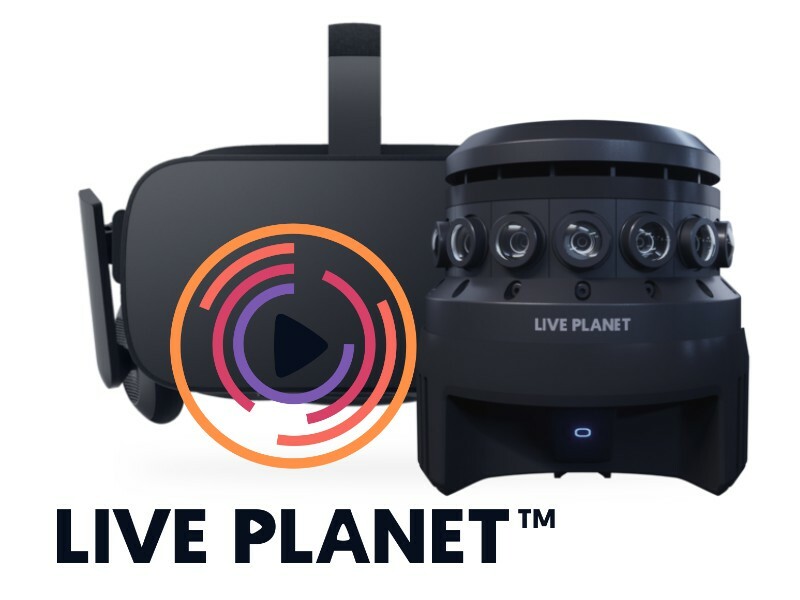 Live Planet is available directly from their website for $9,950, which includes a $1,000 credit for their cloud-based streaming service. Note: for recording videos to the Micro SD, the cloud services are not required. The cloud service is only for live streaming. In the meantime, if you have any questions, please let me know in the comments below. Hi Giorgio. That’s true, but to be fair, the realtime stitching mode is also 4k resolution. Even Titan’s realtime stitching is limited to 4k. Mic – the camera you really need to be comparing this to is the Z-Cam V1. The V1 is just as compact, costs $8,880, shoots 6K/60 or 7K/30, and is capable of near perfect stereo at distances under 12″. It can even do live streaming at 4K mono, although it requires a connected PC. The Live Planet camera’s only real strength seems to be live streaming and realtime stitching, but unless it is capable of higher resolution and better image quality, it seems to be too little too late. I’d love to David, but I don’t have one, and Z Cam appears uninterested in letting me borrow one (since 360R began, they’ve never shown the slightest bit of interest, despite me writing many articles about them). If ever they send me a loaner, I’ll be happy to review it. I would rather buy a brand that is already known such as Insta360. Who knows where the support will be down the line. I would pay for support.